Let me reveal to you the most powerful attraction that long term travel has for me: its amazing power to make me think. Not the kind of everyday thoughts that run through all our minds, but thoughts on a deeper, more challenging, horizon-widening level. I’m sitting in the balcony of my apartment in Chiang Mai, basking in the glory of the gentle, late Sunday afternoon sun. For the most part, it’s been perfect weather since we got here in December, but this is perhaps my favourite time of the day. Birds are chirping in the nearby trees, and I’m feeling relaxed after enjoying a good swim at the pool. A pretty idyllic setting I must say, just the perfect occasion to sit down and put pen to paper on same thoughts that have been brewing in my mind for the last few weeks. I’m actually not too sure what the contents of this post will be, I guess its just an outpouring of sorts. I’ve been worrying that this blog does not yet seem to have a very defined scope, today I’m thankful for this as it’s only due to this fact that I’m able to write this post here without feeling like I’ve gone completely out of topic. Back to what I started off with, the awesome effects on my inner world that result from long term wandering. Short 2-3 week holidays are so jam packed that they often result in my going back home more agitated mentally and spiritually than I was before. On the contrary, a long term trip of 2 months plus tends to challenge me in new ways and offer true moments of growth that stay with me for the rest of my life. By default, the greater the difference between my new surroundings and my own home/country, the more opportunities for learning there will be. The latest proof to that idea is my current trip to South East Asia, a continent which I had never been to before. I had read about travel to Thailand being a culture shock and assault on the senses, and it sure hasn’t disappointed in that area. Not in a negative way, but in a very pleasant way that was just what I needed. Rather than answers, so far this trip has been more about questions. Which is not a bad thing, as finding an answer to a lingering question is one of the best ways to learn something in a convincing manner. One thing I’ve been thinking about is my attachment to material possessions. Back home I tend to worry about my car, what I’m going to wear, and myriad other things. Long term travel necessitates traveling light and having as few possessions as possible, and its so great to be free from any attachment. Looking at how few possessions most of the locals have, and how wide their smiles are has definitely made me ponder what makes us look better. Is it the latest fashion jeans and shirt, or that radiant, genuine smile on our face? These are all questions that arise when you travel to a place where the culture is radically different from the one back home. I believe it makes you see things more clearly. It helps you realise that no place is perfect, and many of us are leading highly unbalanced lives. That is a key realisation I’ve made here, that living a good life is all about balance. One might argue that this is very obvious, but its the realisation of the concept at a deeper, conviction level that I’m talking about here. It’s logical that we need to take care of our spiritual and mental state as well as our physical state, right? Yet so many neglect the spiritual level, and many even neglect their physical well being in favour of more hours at work, or in front of their televisions. It’s mind boggling how we miss the most obvious things, yet this stems, in my opinion, by living a type of life where we are encouraged to fit into the system. In the modern Western life there is not much emphasis on finding a quiet time for meditation, rather the emphasis seems to lie with working as hard as possible, while fuelled by increasing doses of caffeine. Success is measured by the growth of your bank account. This can’t be right, and I for one am making a commitment to seek a different way of life. Another related thought I’ve been having is that we’re truly living in an age of overload, and I’m not only referring to the famous information overload here. I’m talking about an overload of opportunities that we ‘must’ take advantage of, new products that promise to improve our life, new teachings to boost our happiness, and new work opportunities to boost our income. I’m making another commitment to try and do less things, being less of jack-of-all-trades and truly concentrating on those 20% of things that give the 80% of results. Haven’t heard of the 80/20 rule? Well, read about it here, it makes a lot of sense. One final thing I want to note is that there is a not-so-obvious truth in the ‘just do it’ concept. Sure, we hear about it many times, if you want to make a change in your life, if you want to start a new business, if you want to become fitter, just do it. But the truth is that it’s not so easy to just do it, especially when you’re stuck in a situation which makes it look very risky to go after that something which you secretly want. It’s very easy to convince yourself that it would be crazy to break the current status quo. Looking back at all the decisions of this type that I have made in my life, my only regret is that I’ve waited too long to take some of them. Uprooting yourself and going to a new place has the effect of making you search for new friends, and most likely you will attract people who share the same beliefs. Now imagine how good it is if you surround yourself with people who are either seeking the same thing as yourself, or others who have already found/achieved whatever it is you want, and can help you get there. This is what I experienced when I came to Chiang Mai. I’ve been into blogging and internet marketing for quite a few years now, but I was always felt as if people thought I was the ‘crazy guy’ back home. You know, that guy who refuses to build a career for himself, and thinks that he can get money doing some stuff on the internet. Well, here I’ve met dozens of others who are not only doing similar things, but also ones who have been wildly successful at this. I can’t tell you much of an inspiration that is. Still with me? Well, thanks for sticking it out while I rambled on, it feels good to have finally sat down and typed out my thoughts. I hope to have the inspiration/courage/inclination to write again at a later stage, hopefully being able to offer more conclusive realisations rather than thoughts and questions. I must also say that travel is not a pre requisite for thought, contemplation and meditation. Probably one of the most profound experiences in my life to date was a 4 day silent retreat I did less than a kilometer from my house back in my country, it’s just that travel has an inherent facility to force you to think, which is something many of us are in dire need of, in the busy Western rat race society that we have built. Does anyone share any of these feelings? Would love to know your thoughts! My trip happened to coincide with yours exactly. In fact, it’s strange we didn’t meet in CM. (did you meet Stu?) I arrived in Dec and actually stayed until May! I couldnt bring myself to leave a culture that made me feel so at ease in, so loved by those I connected with and so spiritually safe. (And I got to celebrate Songkran!) Everything you have said above, every little morsel, I can relate too. It gives me great comfort to know that my search for a more meaningingful purpose outside this material world, my invaluable experiences with inward reflection and meditative silence (which I am still determined to master) and even my takeaways from the best time in my life, thus far, have been mutually shared between us both. I think it’s worth noting, for other readers, I found Chaing Mai by doing research like this. Reading blog articles like Jeans. I needed a place where I could heal. I had just been divorced one month prior. I quit my job, sold everything I had within those 30 days (even the house which gave me the money to take the trip) packed a bag and left. Yes, it sounds cliche, I know they make movies like this…but you know what, I actually did it. The fact of the matter is, Chaing Mai saved my life. And if it wasn’t for articles like this, words from bloggers like Jean sharing his innermost feelings and new found wisdom, I may have never found my way. Side note: I’m headed back after five years. You still there Jean? Hi Scott, what a pity that we didn’t get the chance to meet while in Chiang Mai. I think that living there has been a lifesaver or at least game changer for many people. I wouldn’t say that Chiang Mai saved my life but it sure did change me in a significant way, and I have very fond memories of our time there. 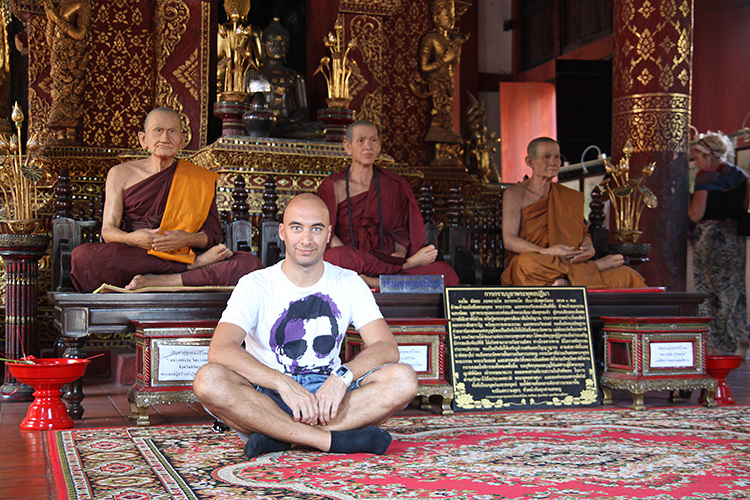 I am now happily based in Barcelona but I’d love to visit Thailand again at some point. Thanks for your sharing your ideas in this comment Marcel. “That is a key realisation I’ve made here, that living a good life is all about balance.” I am totally in sync with what you are saying. I feel that the hardest thing is to embrace all the new ideas, experiences and knowledge and mould them into one coherent and balanced state of mind/spirit/body, and keep that balance on a daily basis. Great inspirational post Jean. Thanks for sharing your deepest thoughts. All you say is very true, but the real challenge is not “discovering” the truth you just wrote about, but actually “remembering and living” that discovery throughout your life. I remember when I first moved to Thailand, I too had the exact same thoughts and dreams you wrote about. Years down the road, I find myself having to buy into the material world once more. Much of it is unfortunately not out of choice alone, but out of exigencies of the “real world I was brought up in”. I think the best way of living is to find some middle of the road between the life we were born into and the newly discovered world that is the world of inner peace.